Notice the statement didn’t say climate change “rules” to be enacted, but “laws” to reduce carbon pollution. 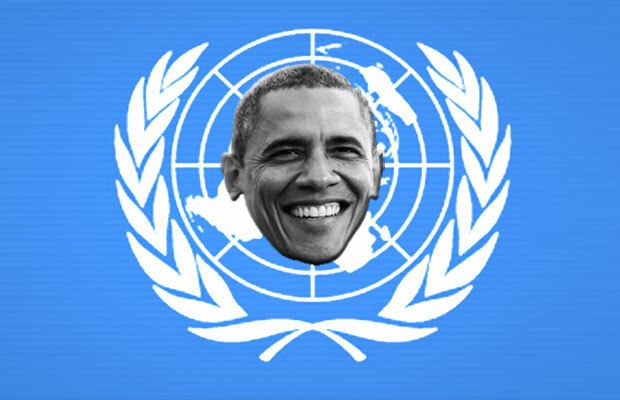 So because Obama and his administration haven’t been able to get everyone on board with the man made climate change “science,” despite continuously espousing that there is a consensus and the debate is over (even though there clearly isn’t a consensus and the debate obviously isn’t over or he wouldn’t have to go around Congress to do this), Obama is going straight to the UN and brokering a deal to get climate change laws passed anyway. The deal would be an attempt to finally pass a legally binding global climate change treaty like the one that failed in 1997, aka the Kyoto Protocol, a mechanism based on the 1992 UN Agenda 21 Earth Summit. Carbon taxes and energy austerity, with even higher energy premiums, are sure to follow. Al Gore must be absolutely thrilled, considering he stands to become the world’s first “carbon billionaire” should such a thing go through. This isn’t the first time Obama, the self-proclaimed “constitutional law professor,” has bypassed Congress to get his way on the climate change policies he wants to enact. Last June, Obama used an executive order to enact regulations that would force coal-fired power plants to reduce their greenhouse gas emissions by 30 percent, triggering lawsuits in multiple states. Delegates at next month’s United Nations General Assembly in New York will continue working on the new deal to be drafted in December. Meanwhile, we are still teaching children in school that America is a constitutional republic — with a straight face.